Indigenous peoples, recognised as the best guardians of the world’s forests, are losing some battles in Brazil in the face of intensified pressure from the expansion of agriculture, mining and electricity generation. The conservation units, under state protection for research, limited sustainable use or as biological reserves, suffered much higher losses, although deforestation has declined drastically in recent years. The expansion of these two preservation instruments would be decisive for Brazil to fulfill its nationally intended determined contribution to the mitigation of climate change: to reduce greenhouse gases by 43 percent as of 2030, based on 2005 emissions, which totalled just over 2 billion tons. But deforestation in indigenous reserves demarcated in the Amazon increased 32 percent in August 2016 to July 2017, compared to the previous period, while throughout the Amazon region, made up of nine states, there was a 16 percent reduction. It is little in absolute terms, but it has other dramatic effects. “They are destroying our culture, our consciousness and our economy by destroying our forests, which we defend because they are our life and our wisdom,” protested Almir Narayamoga Suruí, a leader of the Suruí people in the September Seven TI, where nearly 1,400 indigenous people live, in northwestern Brazil. The destruction is caused by loggers and “garimpeiros” or informal miners of gold and diamonds that have invaded the Suruí land since the beginning of 2016. The complaints and information offered by the indigenous people have not obtained any answers from the government, said Almir Suruí, who became internationally known, as of 2007, for using Google Earth technology to monitor indigenous lands with the aim of preventing invasions and deforestation. “It’s a good alliance, we have access to a tool that facilitates and allows us to have key information. But the government is not cooperating,” he said in a conversation with IPS. His suspicion is that government corruption, widely revealed in the last three years through investigations by the Public Prosecutor’s Office, weakens the government agencies that should fight the invasion of indigenous lands: the Brazilian Institute of the Environment and Renewable Natural Resources and the National Indian Foundation (Funai). This is also dividing his people, with some of its members “co-opted” by loggers and “garimpeiros” to facilitate the illegal exploitation of natural resources, Suruí lamented. Indigenous peoples will be among the main victims of climate change, although their way of life practically does not contribute to the environmental crisis, but rather to solutions, according to the United Nations special rapporteur on the Rights of Indigenous Peoples, Victoria Tauli-Corpuz. In addition to the fact that many of them live in localities subject to extreme weather events, some projects pointed out as solutions, because they reduce emissions of greenhouse gases, directly affect indigenous life, as is the case of biofuels and hydroelectric power plants, which impact their territories. In her reports and presentations, Tauli-Corpuz repeatedly calls for compliance with the United Nations Declaration on the Rights of Indigenous Peoples and International Labour Organization Convention N° 169, to give indigenous people greater participation in decisions that affect them, such as climate change mitigation and adaptation measures. “It is in fact what divided the Suruí people, some of their leaders were involved in the theft of timber with the support of Funai,” said Ivaneide Bandeira, project coordinator of the Kanindé Association for Ethno-Environmental Defence, a non-governmental organisation based in Porto Velho, capital of the northwestern state of Rondônia. “And the Uru-ue-wau-wau people are facing an even worse situation,” she told IPS. They are a small community, which has shrunk as a result of massacres and epidemics brought by the invaders in the last four decades, and is now suffering the invasion of thousands of farmers trying to illegally take possession of lands in the reserve west of the Suruís, in Rondônia. “In Brazil, the TI’s play an important role in curbing the advance of deforestation and in preserving biodiversity, complementing the National Conservation Unit System,” philosopher Marcio Santilli, founder of the ISA, where he coordinates the Politics and Law programme, told IPS. But some of these lands in the Amazon suffer greater deforestation, given “the intensity of the nearby territorial occupation, the execution of major works, the presence of roads, agricultural expansion fronts and mining or logging activity,” said Santilli, who presided over Funai in 1995-1996. “That generates an unfavourable correlation of forces”, which exceeds “the capacity of organisation and territorial control of the indigenous people to discourage and even repel invasions,” he explained. “Targeted actions on some 10 especially affected TI’s, with efficient inspections by government oversight bodies, would reduce deforestation, he suggested. In Brazil there are currently 462 TI’s. This is what has been happening in general in the Amazon since last year, “through permanent actions by environmental authorities in areas of deforestation pressure”, such as the vicinity of the BR163 highway, a route for transporting soy for export in the Amazon, said Santilli. Indigenous people are the eyes of the fight against deforestation even outside their reserves, all the sources interviewed agreed. Their information was decisive in guiding the Ríos Voladores Operation through which the police and the Public Prosecutor’s office dismantled a gang that occupied public lands for logging in the Amazon state of Pará. “The elimination of forests in the surrounding areas have impacts within, such as the drying up of rivers that cross indigenous land and attracting fires,” said Paulo Barreto, senior researcher at the Amazon Institute of People and the Environment (Imazon). Controlled burns, a traditional form of deforestation, have multiplied and have become more destructive in the Amazon, given the greater frequency and intensity of droughts. More flammable material accumulates and forests are more vulnerable, after the drop in rainfall in 2010, 2016 and this year. This is added to another debilitating trend in the Amazon: increased forest degradation, caused by the droughts, timber extraction and other phenomena that reduce forest density, Barreto told IPS. Last year the forest degradation rate reached a record and last October there was an increase of 2,400 percent over the same month of 2016, growing from 297 square km per month to 7,421, according to data from the Deforestation Alert System, created by Imazon. “The degradation in one month exceeded the deforestation for the whole year. That impoverishes the forests biologically while the fires affect the health of animals and humans with the smoke. Brazil is not prepared to face this phenomenon, which requires strong local prevention measures,” said Barreto. 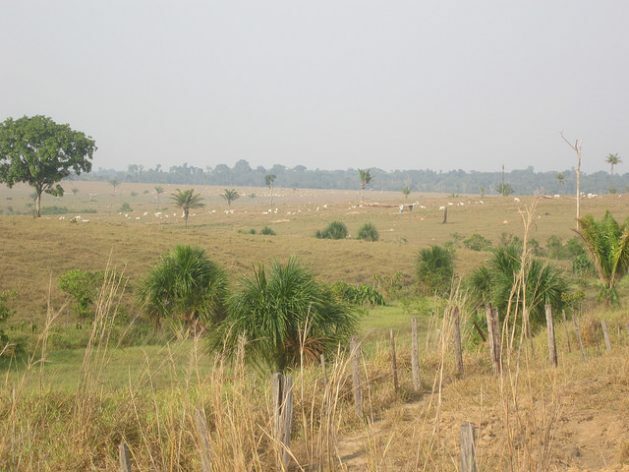 Restoring forests, mainly at the sources of rivers and along the banks, is a way to mitigate part of the damage, a technique used by the Xingu Seed Network, an initiative of the ISA launched in 2007 along the upper section of the highly deforested basin of the Xingu River in the Amazon rainforest. In addition to supplying companies and institutions involved in reforestation, it generates income for the approximately 450 mainly indigenous collectors of seeds, plays a role in environmental education, and brings together different actors, such as farmers and landowners, said Rodrigo Junqueira, promoter of the Network and coordinator of the ISA Xingu Programme. “I learned a lot about trees, life and the importance of nature, in addition to earning money as head of the ‘seed bank’” in Nova Xavantina, 19-year-old student Milene Alves, in the state of Mato Grosso, told IPS. Her father, a fisherman, “overcame depression” and her mother, a homemaker, changed her life, both by devoting themselves to the collection of seeds, said Alves, who chose to study biology at the university after her experience. All this is crucial for the future of climate change. Nearly 24 percent of the carbon stored on the earth’s surface is in the tropical forests in indigenous and communal lands, according to the international World Resources Institute. According to the 2010 census, the indigenous population in Brazil is 897,000, which is 0.45 percent of the country’s total population, while the TI’s cover 1.17 million square km, equivalent to 13.8 percent of the country’s territory, but encompassed mostly in areas especially vulnerable to temperature rises. This article is part of a series about the activists and communities of the Pacific who are responding to the effects of climate change. Leaders from climate and social justice movements from around the world will meet in Suva, Fiji Dec. 4-8 for International Civil Society Week. 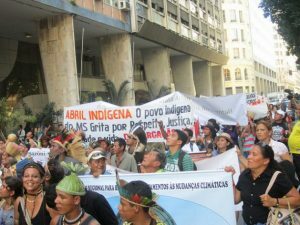 The post Indigenous People, Guardians of Threatened Forests in Brazil appeared first on Inter Press Service.